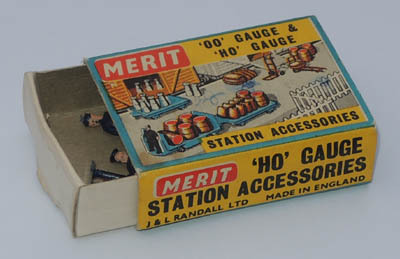 Merit was an extensive range of accessories made in Britain in the 1960s for the model railway market. The variety of products in this range, big and small, was impressive, but for our purposes we need only concentrate on the sets of figures, which were also surprisingly extensive. Each set came with about five figures, factory painted and standing on a clear circular plastic base. Originally these are packaged in what we would call matchboxes, shown below, but later they appeared in more modern blister packs. Each of these contains a single sprue of figures from several of the smaller sets, all unpainted and unbased, which makes them more convenient for those that might like to convert them or otherwise use them for something other than a model railway. The advertised scale was OO/HO, so at 1/76 this is a bit smaller than our usual 1/72 scale, but if the figure is right then the scale difference may not matter. The unpainted figures come in a white plastic, which sadly is tricky to photograph for this page, but hopefully you will get some idea of any potential these figures may have for your own project. Any railway will need seated passengers, either on the platform on in the carriage, so this was a logical place to start. As you can see, the quality of the sculpting is pretty basic, and what you can't see from our image is that the figures are what we might call semi-flat, so looking from the side there is little to them at all. This may have been deliberate, as the interior of some model carriages may not have been roomy enough for anything more substantial, Detail is pretty minimal and there is little in the way of folds in clothing, but of course these were meant to decorate a large railway scene, and not be examined close up like this. Also of note is the evident flash in some places, and of course the very old-fashioned clothing on display. However the couple on the end are quite sweet, and for the intended purpose these figures would do the job. To fill those platforms, and perhaps the streets beyond, you need some standing people. Here we have a smart man in an overcoat and trilby holding a small bag or case, a woman with a jacket and small hat and something draped over her arm, and another neat woman with small hat, large coat and holding a bag in the right hand and what looks like a single flower in the left. Beside her is a man in suit and tie holding a small set of golf clubs, and two small children holding hands. Let's be honest, this is not the usual scene at a railway station of today, but of course these figures are many decades old. Back in the 1960s most people still dressed their best to travel, and the wearing of hats was still common, although we doubt the golf clubs were very accurate even then. Even the stances here are stiff and formal, whereas today both dress and posture would be very informal, so this is not a set likely to be of use on a modern layout. More very static and stiff standing poses here, and again we find people very formally dressed. Everyone wears a hat and both the men carry a stick, or is that a cane? The woman have small hats, one with a jaunty feather in it, which today is only likely to be seen at a wedding or Royal Ascot. For some reason the selection includes a postman in his smart uniform and holding a letter, but his face has been strangely sculpted, though all of them have sort of puffed out cheeks which look odd. The legs are completely straight, so no suggestion of knees here, and generally a fairly basic piece of sculpting depicting a type of traveller you rarely see these days. 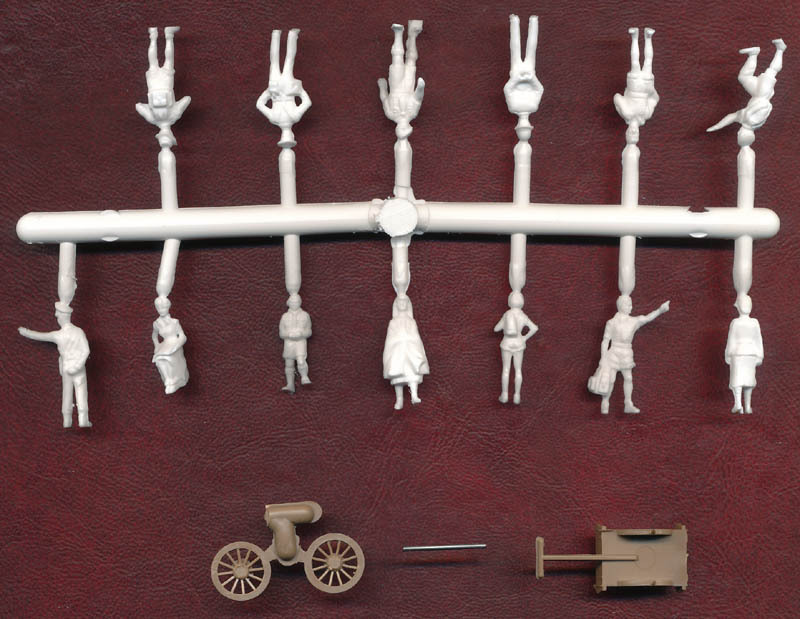 Finally for this sprue we come to the little plastic figures that cater for the rest and make sure the trains run properly. This begins with three men neatly uniformed with jacket and peaked cap, one holding aloft a lamp, one a flag and the third in an odd generic kind of pose with his right hand pointing forward, which of course means the mould could not sculpt any sort of a hand. Completing the set are two porters carrying luggage, also neatly turned out in waistcoats, ties and more peaked caps. Like the rest of the figures these are quite thin, and with completely straight legs rooted to the ground there is no movement at all here, so these are far from active. The sparse detail does not make for attractive figures either, although the uniforms seem fine for the period when they were made, and for years before too. 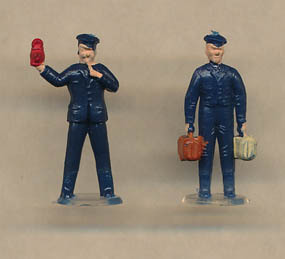 These figures have a noticeably different style to the passengers that had gone before. First, they are that bit bigger, and so more 1/72 scale than the earlier output. Second, the figures are fuller, not at all flat, and the detail is sharper and easier to see. However we would still not call these figures attractive, with their oversized heads and still limited attempt at creases and folds in clothing. The Army Personnel begins with an officer in battledress and peaked cap, but standing with hand in pocket, which is very relaxed for an officer. As the detail is better we can see that this man has a fine moustache, and he holds something small in his left hand, but we cannot guess what. As he wears battledress he dates to the 1960s at the latest since it was during this decade that battledress was phased out of British service. Similarly the two soldiers that come next are also in battledress, and wear the berets made normal walking out wear after the War. This of course was an age where military conscription was still in force, so many young men would be seen on public transport dressed this way. In another new development for Merit, these figures are not just standing stiffly - one is in relaxed pose and carrying a case, while the other is actually walking forward - a first! Although he still has his arms stiffly down by his side, these poses are at least more natural than those that came before. Finally we have two WRAC members, again in their version of battledress and wearing berets. Both carry their shoulder bag and one stands while the other walks. These are like the Army personnel in being larger and not flat, but the detail is still soft and these are to our eye more ugly than the Army. All of them seem to have melted slightly, and should only be seen at a distance! The officer carrying the case is little better, and his uniform is as hard to make out as the standard square-rig outfit of the two sailors next to him, both carrying their kit bag and on the move, though awkwardly posed. The two Wrens are standing still but no better sculpted, completing a very poor little group. These are the best sculpts of the three military sets, which is not saying a great deal, but in fact they are not too bad at all. Detail is not good and there is almost no creasing or folds to the clothing, but the proportions are fair and the poses quite natural. We have two men in peaked caps and service uniform, a third in the RAF battledress, and two WAAFs also in service dress. Nothing very exciting, but entirely suitable as passengers or passers by, and perhaps useful for decorating some airfield diorama too. This set is back to the better quality Merit could produce - not great by modern standards, but reasonably proportioned, good poses and fair detail, with virtually no flash. There is not much to say about this collection of figures. It's a group of people in leisure wear carrying bags or rucksacks as if on a hike, although no one here is actually moving at the moment. They seemed to have stopped to check their way, or to look at the view. Once more fashions have moved on since this set, so not a lot of uses come to mind, but we were intrigued by the last figure, of a woman apparently sitting on a rucksack with a large map unfolded on her lap. She wears a knee-length skirt rather than shorts, and a collared blouse, so seems more of a casual walker than the rest of them. A good one to scatter about scale 'countryside', but not a great deal else. On the face of it this should be one of the most useful sets in the range for military modellers. The public service personnel are, from left to right, a military policeman, a nurse, a policeman, a woman police constable (so called at the time) and probably a first aider such as St Johns Ambulance at an event. You don't see military police on the streets too often, and the nurse is no more than a uniformed passenger or passer by, but the others are useful for general street scenes and for events. Time however has moved on a long way, and none of these figures look right for modern day. Certainly the appearance of the British police has changed enormously since these two figures were made, and if you are looking for something a bit more modern than the Bachmann range is more what you need. They are fine for their era, so if the sixties is what you are creating then this set is for you. Finally we come to one of the more obscure subjects Merit produced. We have here two boy scouts with the scout master and a trek cart. From their size we would guess the boy pushing is in his teens and the boy at the front is younger. As with any uniform, that of the Boy Scouts has moved on a lot since these figures were produced, and no scout today wears this ensemble in the UK, especially the beret, although we understand scouts in some countries do so. Before seeing this set we had never heard of a trek cart, but it appears to be a relatively common device even today, used to carry items for camping or other activities. The likelihood is that this basic design has changed little. The model here is very nice, being simply the main body of the cart, a metal rod as an axle, and the two wheels. It fits together well and the wheels rotate, so what more could you want. So that is all there is. Merit did make some other sets of figures, or products that included figures, including a number of railway workers of all sorts and some school children. These are only available as pre-painted sets as far as we know. As usual there is not a lot here that seems obviously of use for those with an interest in military subjects, and the quality is not particularly good either, but perhaps occasionally one or more figures may fill a need, so it is always worth remembering what model railways have to offer our hobby.